The arrests were peaceful and without incident. 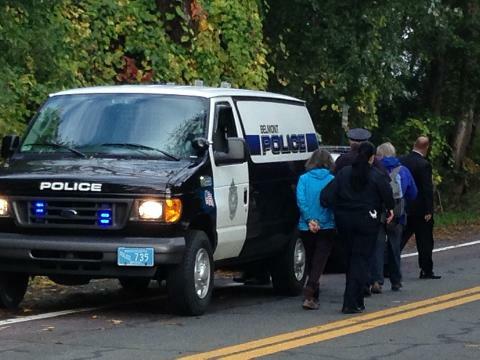 Dana Demetrio, University of Vermont student, Sylvia Gilman, Illustrator with Peace Action; Ben Beckwith software repair and musician; and Paula Sharaga, children’s librarian, were agreeably escorted by police out of the forest into paddy wagons after refusing to leave when asked to do so. They say permits are still pending or “up in the air” in Belmont and it is nonsensical to clear-cut before building permits are approved and municipal matters settled in both Cambridge and Belmont. FAR is a member of the Silver Maple Forest Alliance, which plans another rally Monday, October 20th at 7:00 a.m. at the forest site on Acorn Park Drive. FAR also reported in the press release that on Monday, October 20th, the Cambridge City Council will hear a policy order requesting that no Cambridge property be used for the “development designs” or “square footage replication area,” As the developer’s design plans for the site extend across the Belmont border into Cambridge, this measure has the potential to halt the clearcutting. In addition, a temporary injunction has been filed in Woburn District Court to stop the tree felling without known results.